In this sequel to The Lightning Thief, Percy Jackson is back and facing new problems. Something's wrong at Camp Half-Blood. The tree that protects the camp from monsters is ill, poisoned by someone or something. Chiron is suspected and he's been fired from his job at the camp. Monsters are attacking the camp more and more frequently as the tree sickens further. Percy's got to find a way to heal the tree or Camp Half-Blood will cease to exist. Add to that the frightening dreams he's been having about Grover. He knows Grover is in trouble, but the new camp leader refuses to let him go on a quest. 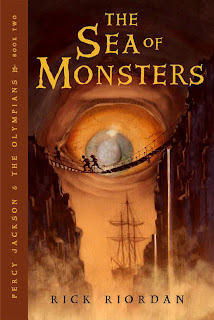 This second, action-packed installment in the Percy Jackson & The Olympians series was just as good as the first. Riordan combines humor and adventure to make a page-turned that I couldn't put down. I'm not a big series person, but I will definitely be checking out the rest of these books! Highly recommended for fantasy fans, Greek mythology buffs, and anyone who wants a rip-roaring good story.